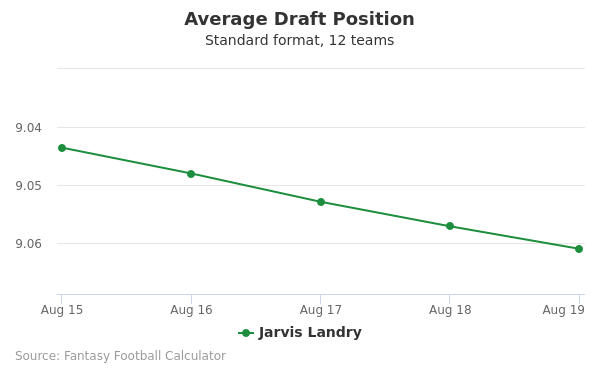 Jarvis Landry's fantasy value is measured by his average draft position (ADP) in fantasy football mock drafts. 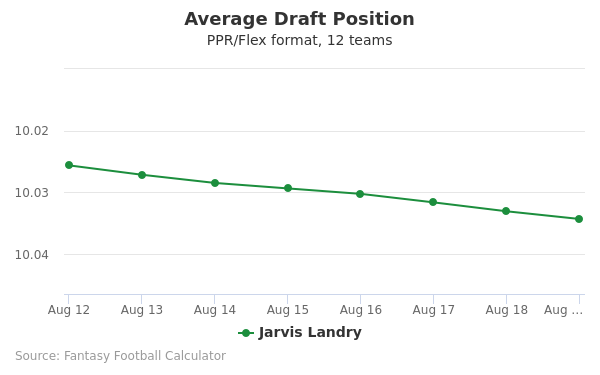 In recent drafts, Landry's current ADP is 5.06, which indicates that his fantasy outlook is to be the 6th pick of the 5th round, and 53rd selection overall. 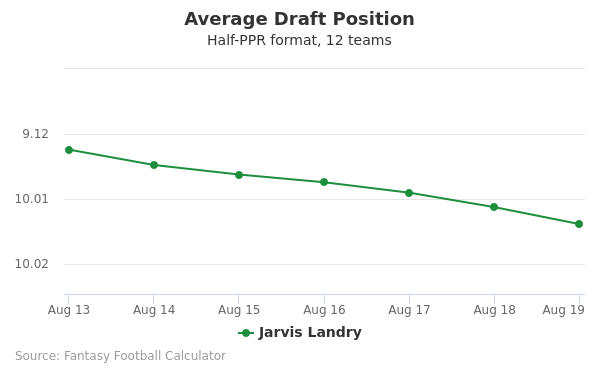 The code below will display a graph that updates every day to show the ADP data for Jarvis Landry for the past 30 days in 12-team PPR leagues. Draft Alshon Jeffery or Jarvis Landry? Draft Jarvis Landry or O.J. Howard? Draft Jarvis Landry or Tevin Coleman? Draft Jarvis Landry or Tyler Boyd? Draft Jarvis Landry or Kenyan Drake? Draft Deshaun Watson or Jarvis Landry? Draft Jarvis Landry or Will Fuller? Draft Chris Godwin or Jarvis Landry? Draft Evan Engram or Jarvis Landry? Draft Calvin Ridley or Jarvis Landry? Draft James White or Jarvis Landry? Draft Jarvis Landry or Mike Williams? Draft Hunter Henry or Jarvis Landry? Draft Jarvis Landry or Lamar Miller? Draft Jarvis Landry or Jordan Howard? Draft Doug Baldwin or Jarvis Landry? Draft Jarvis Landry or Russell Wilson? Draft Jarvis Landry or LeSean McCoy? Draft Jarvis Landry or Tyler Lockett? Draft Drew Brees or Jarvis Landry? Draft David Njoku or Jarvis Landry? Draft D.J. Moore or Jarvis Landry? Draft Jarvis Landry or Sammy Watkins? Draft Jarvis Landry or Rashaad Penny? Draft Jarvis Landry or Robby Anderson? Start Alshon Jeffery or Jarvis Landry? Start Jarvis Landry or O.J. Howard? Start Jarvis Landry or Tevin Coleman? Start Jarvis Landry or Tyler Boyd? Start Jarvis Landry or Kenyan Drake? Start Deshaun Watson or Jarvis Landry? 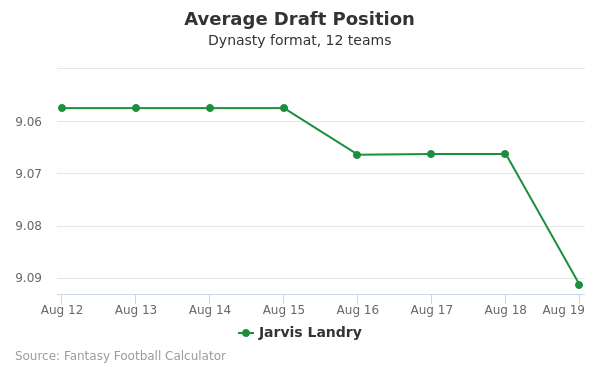 Start Jarvis Landry or Will Fuller? Start Chris Godwin or Jarvis Landry? Start Evan Engram or Jarvis Landry? Start Calvin Ridley or Jarvis Landry? Start James White or Jarvis Landry? Start Jarvis Landry or Mike Williams? Start Hunter Henry or Jarvis Landry? Start Jarvis Landry or Lamar Miller? Start Jarvis Landry or Jordan Howard? Start Doug Baldwin or Jarvis Landry? Start Jarvis Landry or Russell Wilson? Start Jarvis Landry or LeSean McCoy? Start Jarvis Landry or Tyler Lockett? Start Drew Brees or Jarvis Landry? Start David Njoku or Jarvis Landry? Start D.J. Moore or Jarvis Landry? Start Jarvis Landry or Sammy Watkins? Start Jarvis Landry or Rashaad Penny? Start Jarvis Landry or Robby Anderson? Jarvis Landry was born on November 28, 1992 in Convent, Louisiana. Raised by a single mother, Dietra, and an older brother, Gerard, Landry was a multi-sport athlete in high school playing football, baseball and running track at Lutcher High School. In his senior year Landry was selected to play in the 2011 Under Armour All-America Game where he had 8 receptions for 70 yards and 1 touchdown. Landry was a 5-star recruit. He committed to playing for Louisiana State University and, according to his website, Landry ended his high school career with 241 receptions, 3,902 yards and 50 touchdowns, ranking 4th nationally as a receiver by Rivals.com and Scout.com. After an injury sustained at summer training for LSU in 2011, Landry managed to play all 14 regular season games, earning 4 receptions for 43 yards and 11 tackles on special teams. Over his 3 years at LSU he played 40 games with 12 starts. In his junior year Landry was named to the second-team All-SEC with 10 touchdowns and 77 receptions for 1,193 receiving yards. According to LSU, Landry left as one of the most productive wide receivers in the school’s history with 137 catches for 1,809 yards and 15 touchdowns, ranking 10th in LSU history for career receptions. Landry entered the NFL Draft in 2014 after completing his junior year of college. You can see highlights from his time at LSU here. At the 2014 Draft, the Miami Dolphins selected Landry 31st in the second round, 63rd overall. Landry strained his right hamstring running the 40-yard dash at the Combine. His 40 time was 4.77 seconds with a vertical jump of 28.5 inches. Despite the injury, Landry recorded the most catches by a rookie for the Dolphins with 84 receptions. He had 5 touchdowns and 758 receiving yards. During the 2015 season, Landry broke O.J. McDuffie’s franchise record for most receptions in a season by catching 110 passes for 1,157 yards and 4 touchdowns. Landry was named Co-MVP for the Dolphins and was selected to play at the 2016 Pro Bowl. In his first two seasons in the NFL he set the record for most receptions with 194. That year he also received a $23,000 fine for using abusive language with an official in an October game against the New York Jets. Landry was selected to play in the 2017 Pro Bowl as a replacement for the Bengals' injured A.J. Green. The NFL selected Landry as one of the top 100 players in the 2016 season, ranking him at #98. View highlights of Landry’s 2016 performance here. Landry lives in Fort Lauderdale, Florida near Dolphins offensive tackle Ja’wuan James. According to an article from SBNation, Landry writes lyrics and plays the guitar in his spare time. According to the Palm Beach Post, Landry often supports the Cystic Fibrosis Foundation because an ex-girlfriend died of the disease in 2015. You can follow Landry on Facebook at https://www.facebook.com/iamjarvislandry/, on Twitter @God_Son80, on Instagram @juice_landry, or on his website: jarvislandry.com. Landry is currently in a 4-year contract with the Dolphins for $3,474,911 including an $847,208 signing bonus. His base salary for 2017 is $893,852. Landry wears #14 for the Miami Dolphins.